China's leading express delivery firm, SF Express has successfully tested a pilotless freighter aircraft, which it plans to start using in 2023. 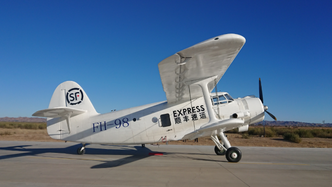 The Avic Y-5B biplane is based on the design of the 70-year-old Russian Antonov An-2 and is being developed by the China Academy of Aerospace Electronics Technology and SF Express under the new name Feihong 98. The pilotless aircraft made its first flight last month at a test facility in Baotou, a city in Inner Mongolia. According to a report in Pandaily, the aircraft has a maximum takeoff weight of 5.25 metric tonnes, a top payload of metric 1.5 tonnes and a volume space of 15 cubic metres. The Pandaily report noted that "although it is unlikely that the skies will be filled with Feihong-98 transport drones anytime soon, if the technology is taken further, aircraft pilots could potentially be replaced at some point in the next 20 to 30 years." In another development, a joint delivery service called "Bold Delivery" set up by China Railway Corp and SF Express last year to meet increased demand for parcel delivery following the Chinese shopping festival known as Double 11, or Singles Day, has put on extra high-speed trains and cargo routes to 58 major cities in China. In a joint statement, the partners said that a daily average of more than 850 high-speed passenger trains and 350 slow trains with baggage cars will be used until November 20 to cope with the logistical load created by the November 11 shopping festival. All passenger chairs in carriages used for the Bold Delivery transport have been removed so that each can accommodate 5 metric tonnes of goods, such as documents, garments, food and electronic devices, a report in the China Daily said. Previously, the railway company modified bullet trains and installed a facility that can accommodate 500 kilograms of parcels, and used spare spaces, such as empty chairs, on high-speed passenger trains to transport parcels, the report said, adding that the new configuration means that delivery time will be cut to six hours, much faster than road transportation, which usually takes 20 to 24 hours. This year's November 11 full-day sales on Alibaba's online e-commerce platforms alone reached 213.5 billion yuan (US$30.7 billion), setting a record, according to media reports. The China State Post Bureau said that the shopping frenzy created more than 1.35 billion parcels on November 11, an increase of 25% over the same period last year.